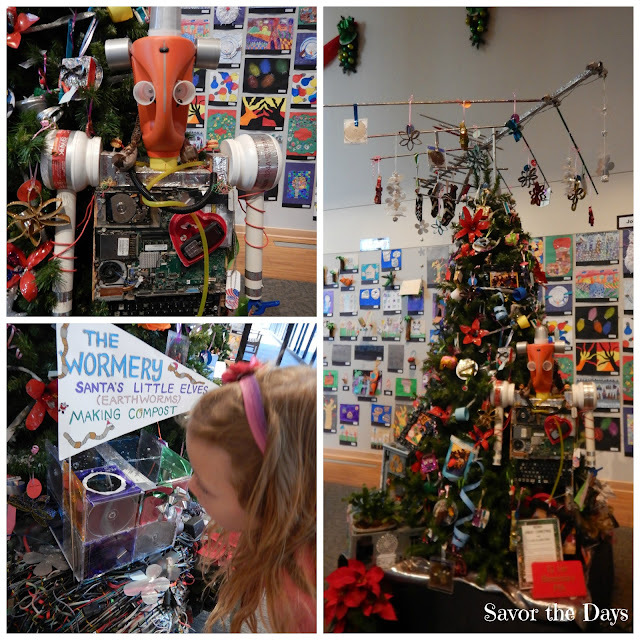 The Irving Arts Center is celebrating Christmas with their 24th annual Christmas Tree Decorating contest so we stopped by to see some of the amazing trees that students from different schools have created. At first we just thought they were nice trees but then we realized that there was a theme to them. They were all decorated with recycled materials! How cool is that?! 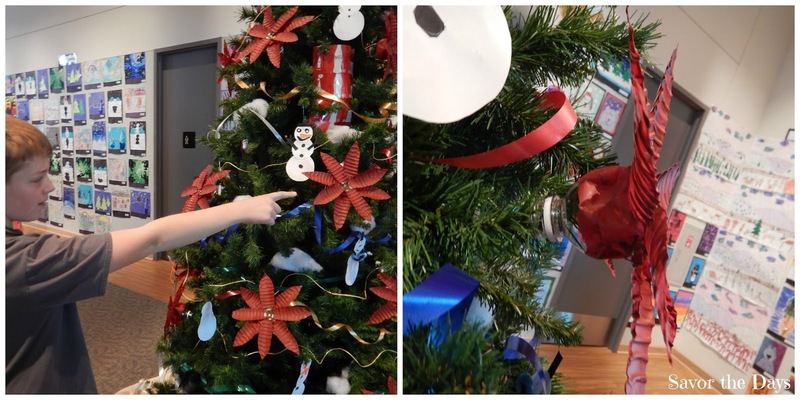 Nicholas was the first to discover it when he noticed this poinsettia was made from a water bottle! How creative! Once we realized how special these ornaments were, it became a fun game to look over each tree in detail and see who would discover the next really unique ornament on a tree. It was a lot more fun than what I had expected. 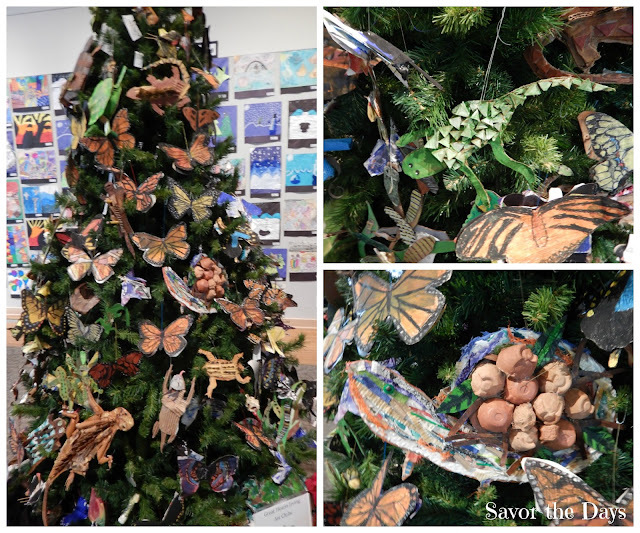 This tree below was made with a nature theme - butterflies, lizards, turtles, etc. It was my favorite of all of them simply because of the cute critters all over it. There was one tree that was computer/electronics themed complete with an antenna tree topper! The walls of the exhibit room and covered with art work from school children. It was fun to look at the different subjects and different skill levels on display. At the end of the Christmas Tree exhibit room there was another exhibit called The Book Forest. Old books and magazines were the media used to form trees and various decorations throughout the room. I don't know that I could actually do this to a book but the finished project does look pretty cool. While we were there we also checked out the National Geographic Rarely Seen: Photographs of the Extraordinary photography exhibit. The photographs are unbelievable! A lot of the pictures are of natural wonders like this picture of Thor's Well. It is a real salt water fountain in Oregon that is driven by the ocean tide. Nicholas just stood and stared at this picture of the Northern Lights for a long time. He read the plaque and told me all about it. This picture is actually two pictures that have been joined together. Of course this picture got a smile out of my little dare-devil. It's called Dangle if you Dare and it's a picture of some crazy guy's feet dangling from a skyscraper in China. I wonder if his mother knew he was doing that? Look at the detail and perfection you can see in this snowflake when viewed up close! It's such a beautiful example of God's handiwork. Nicholas really enjoyed looking at the details in the photograph of a white tiger but every single one of these pictures were an amazing sight to see. Nicholas was entranced by the whole exhibit. He slowly went through and looked at every single photograph AND read each and every plaque describing the photograph. He was really studying each one intently. He especially like the picture of the Man o' War here. He will be quick to tell you the differences between a Man o' War and a Jellyfish. He was already interested in being a field photographer after our recent trip to the Perot Museum but now he is more interested than ever in nature photography. Rachel stared dreamily at the giant chandelier for a long time. Then she announced that we needed one for our house! It really is a work of art by itself. Here is the view from beneath the chandelier. 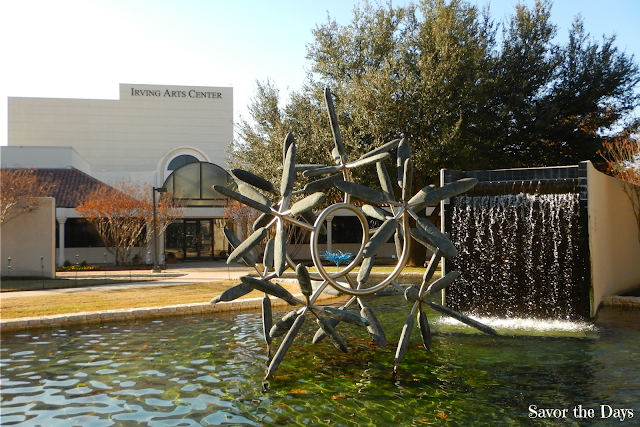 Finally, we headed outside to check out the sculptures and the water features. I didn't notice any new structures since the last time we were here. But its always a fun place to run around and get the wiggles out after being in a quiet art exhibit for a while. And play hide and seek. I wonder where Rachel could be? The Irving Arts Center is located at 3333 North MacArthur Blvd. in Irving. Gallery Admission is FREE! Gallery Hours: Mon, Tues, Wed and Fri: 9:00 a.m. to 5:00 p.m., Thursday: 9:00 a.m. to 8:00 p.m., Saturday: 10:00 a.m. to 5:00 p.m., Sunday: 1:00-5:00 p.m.
Have You Seen Chimney This Morning?? ?